Re: Jupiter finally goes "electric"! Jupiter's magnetosphere (F. Bagenal, Ann. Rev. Earth Pl. Sci., 20, 289, 1992). The outer planet most extensively studied has been Jupiter. Its Galilean satellite Io has the most active volcanism in the Solar System, and its atmosphere interacts electromagnetically with the surrounding medium, the Io plasma torus. This interaction is itself the source of the oxygen and sulfur ions of the torus. The plasma is picked-up by Jupiter's magnetic field into corotation with the ionosphere. Eventually, the plasma populates the entire Jovian magnetosphere. Other contributions are from the ionosphere and the solar wind. Jupiter's strong magnetic field, fast 10-hr rotation, and internal plasma sources result in an immense a magnetosphere with a strong corotational character. It is stretched and flattened by an equatorial current/plasma sheet extending from the Io/torus source at 6 Rj out to ~30 Rj where corotation breaks down. (1 Rj ~ 11 Re ~ the size of the Earth's magnetosphere!) The outermost regions are influenced by the solar wind pressure, and so the magnetopause can quickly change size by a factor of 2 following changes in the solar wind. The coupling of this giant, fast-rotating, internally supplied magnetosphere with the solar wind is complex. Even with extended Galileo in-situ measurements since 1995, we still have a lot to learn about this system. The atmosphere-magnetosphere interaction produces 10^14 Watts of auroral power, with emissions spanning from X-ray to radio wavelengths. This is 10,000 times more powerful than the Earth's aurora, and could light all cities around the world! Emissions from both H2 and H are detected in these images. The HST images have shown that the aurora is dominated by main ovals of bright and discrete emission at high latitudes on the north and south polar regions, mapping farther than 15 Rj into the middle magnetosphere. These are accompanied, at least on the north, by emissions that are poleward of the main oval, mapping to the outer magnetosphere. The exact mapping is hindered by uncertainties in the magnetic field models, in the internal non-dipolar components and contributions from the current sheet and magnetopause currents. The STIS image clearly shows emissions at lower latitudes of the main ovals that are at the footprint of the magnetic field lines connected to Io and its extended (wake) tail. Emissions mapping to Europa and Ganymede have also been seen (Clarke et al. 2002). One major question about this fast-rotating system is to understand the importance of dependencies of the aurora and thus of the magnetosphere on corotational properties which are fixed in magnetic longitude and thus internally controlled, versus dependencies on the magnetic local time which are dominated instead by the solar wind interaction. All the auroral emissions are highly variable in brightness and morphology, and we can use these variations to learn more about the system. The WFPC2 images shown on the left figure show a partial Jovian rotation. Some spots of emission along the ovals were seeing to corotate with the planet. However, other properties were seen to depend on the magnetic local time. In particular, the brightest emissions were seen associated with a strong auroral event that was taking place and remained confined to the dawn regions. There are other, more subtle effects that we can see in the images which we are currently studying, such as the behavior of the emissions as the rotate from the morning to the afternoon. The Galileo orbiter has toured the system since the mid 1990s, and has provided much valuable information about the Jovian magnetosphere. On December of 2000 the Cassini spacecraft flew by Jupiter on its way to Saturn, and could measure the solar wind impinging on Jupiter and dusk side of the magnetosphere. Galileo was also making its in-situ measurements of the system. HST also took a limited set of auroral images during this period. Some results have been published from this special set of coordinated observations (Science, 2002). But a full study of that STIS dataset still awaits. Much information is still buried in the extensive HST dataset, which started to be collected in 1994 with WFPC2. This is the basis for our archival program at the Univ. of Arizona. 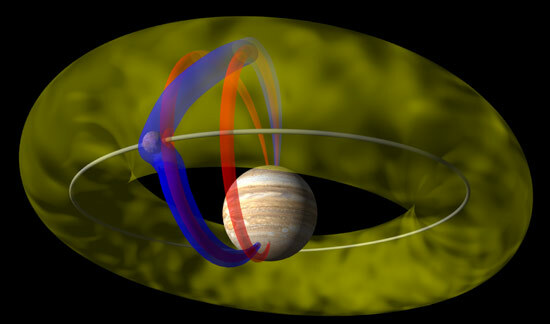 In addition, MHD simulations of the Jovian system and its interaction with the solar wind have only recently been made, and we are aiming at comparing the auroral observations with the MHD simulations, magnetic field models, and simultaneous Galileo measurements made by our colleagues at UCLA. FS3 wrote: In line with all those recent changes in our solar system - most possibly due to enhanced EM-activity by our Sun - a former white spot on Jupiter, northeast of the Little Red Spot (in the pic below that one on the left), has turned RED as well. The Hubble Space Telescope orbiting Earth has taken impressive new images on May 9 and 10 with its Wide Field and Planetary Camera 2. Along with the latest images obtained by New Horizons from a distance of approximately 1.5 million miles (2.4 mill.kms) from Jupiter at a resolution of 14.4 km (8.9 miles) per pixel that told us more about the Little Red Spot (LRS). The maximum winds speeds there of about 384 miles per hour (between 155 - 190 meters per second) far exceed a Category 5 storm on Earth! "The new observations confirm that the thermal structures, wind speeds, and cloud features of the LRS are very similar to those of the GRS,"
says Dr. Hal Weaver, a member of the study team from APL and New Horizons project scientist. "Both the LRS and the GRS extend into the stratosphere, to far higher altitudes than for the smaller storms on Jupiter." But still a mystery remains of why the GRS, the LRS and now this third one, may be so red. As the latest finding of the Hubble shows "a planetary game of Pac-Man" is viewed on Jupiter! In my astronomy monthly around Jan 2008 they said that maybe Jupiter itself was a Z Pinch. junglelord wrote: In my astronomy monthly around Jan 2008 they said that maybe Jupiter itself was a Z Pinch. Which page? Purchased the issue, but wasn't sure where or how strongly it was indicated... I think they had mentioned the Z-machine (I think they used a photo). Don't recall if they specifically said Jupiter's core might be part of a Z-pinch, or not? The path of the space probe Voyager 1 was designed to check out this dynamo, by flying close to where its currents were expected to flow. It did so on March 5, 1979, and its magnetometer very clearly detected the signature of a current of about a million amperes. The researchers propose that a beam of electrons is being transferred from one hemisphere to another, causing the fainter spots. FS3 wrote: Back to the RED SPOT on Jupiter for a moment. According to the team from the University of Liège there would be enough amps for such an effect! So indeed, those red spots could be a hint for an electric effect - although not from Jupiter - but being caused by Sulfur from Jupiter's companion, Io! They tried over 50,000 models, and were looking at a three tier composite with a solid core, surrounded by liquid hydrogen, surrounded by outer layer of gas. Last edited by junglelord on Mon Jul 21, 2008 9:18 pm, edited 1 time in total. I just think the basics are quite interesting. IE, you've got a flow of electrons (electron beam), moving in one direction from one hemisphere to the other. But, as the mainstream would probably point out, if we were only talking electrostatics, the charge imbalance leading to the flow of charged particles would quickly extinguish as more charge builds up at the receiving end. However, that's where they would also probably hit a stumbling block if the phenomenon persists. That's where electrodynamics, I think, comes in. IE, we're talking about flows of charged particles "in a circuit." And the circuit has to close (my informed guess). IE, rather than simply being "electrons jump from the north pole to the south pole and STOP" (which would cease as soon as enough charge transferred to balance the equation), it would need to be "electrons flow from the north pole to the south pole" (or vice versa, which ever way it's going; just an example) "then close the circuit by flowing SOMEWHERE back from the south pole to the north pole such that charge does not accumulate on the south pole and stop the exchange." Voila, you get a circuit. The question is where does the circuit close? ( ) around the circumference? ( | ) through the middle (the core, the axis, whatever)? For gravity to compress helium to a metallic form, wouldn't it have to be electrically neutral? The electrostatic forces being so much more powerful than the gravitational, wouldn't even a moderate level of charge prevent the helium atoms getting so close tegether, unless magnetically confined? Image of Jupiter's radiation belts mapped from 13,800-megahertz radio emission measured by the U.S. Cassini orbiter in January 2001 during its flyby of the planet. A superposed telescopic image of Jupiter to scale shows the size and orientation of the belts relative to the planet. Colour coding indicates the strength of the emission, with yellows and reds being the most intense. 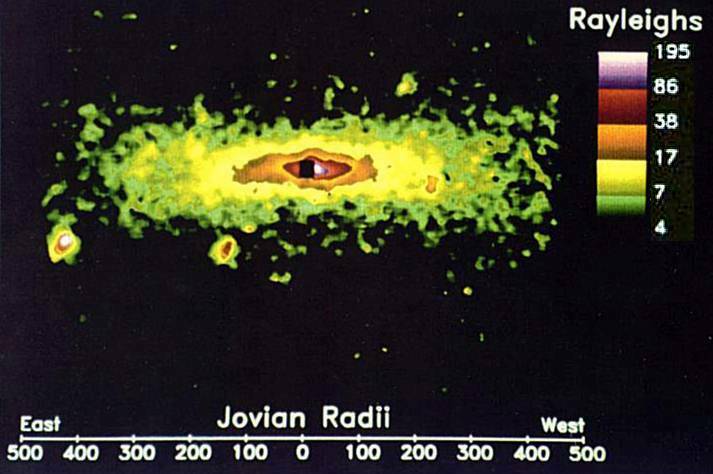 Interpreted as synchrotron radiation, the emission delineates a doughnut-shaped region surrounding Jupiter where electrons moving near the speed of light radiate as they gyrate in the Jovian magnetic field. In the image, the belts appear tilted (trending from upper left to lower right) with respect to Jupiter's equatorially aligned cloud bands; this is due to the inclination (by 10°) of the magnetic field axis to the rotational axis. Data images of the sodium clouds. Left column: small field of view (FOV) spanning 15 Jovian radii (RJ). Middle column: medium FOV spanning 70 RJ. Right column: large FOV spanning 1000 RJ. Jupiter is at the center of each image. The banana cloud (“B”), jet (“J”), and stream (“S”) are labeled in the small FOV images. Small FOV images are not calibrated for absolute brightness, so relative brightness above the background nebula brightness is indicated in gray-scale, with each year scaled according to the intrinsic brightness of the Na. Note that Io saturates a region in the small FOV images that is much larger than Io itself, and that an occulting mask was placed over Io in the 1991 image. A larger occulting mask for lunar observations was used in the 1994 large FOV image, obscuring much of the central region of the Na nebula. In the 1995 medium FOV, a region of the image is displayed in gray-scale to highlight the jet. Circles indicating Io’s location in the medium FOV are not drawn to scale. Jupiter's strong magnetic field sustains a giant magnetosphere in which most of the basic plasma processes are similar to those acting in the Earth's magnetosphere (driven by the solar-wind interaction and by processes of internal origin), but differences such as its size, rotation period, magnetic field strength, plasma sources and distance to the Sun give rise to different boundary conditions and make the comparison of the processes effective in each magnetosphere very exciting. One of the specificities of Jupiter's magnetospheric activity is the very powerful aurorae which result from the magnetosphere/atmosphere coupling, delivering several 10 watts into each polar region (Herbert et al. 1987, Livengood et al. 1992), more than 100 times the average Earth aurora energy. This auroral energy input also significantly exceeds the solar UV input, and is suspected to dominate the atmospheric dynamics and energetics on a planetary scale (Sommeria et al. 1995). The aurorae are due to precipitation along high latitude magnetic field-lines of energetic charged particles of magnetospheric origin, resulting in collisional excitation of the main atmospheric constituents, H and H. These aurorae were discovered more than a decade ago in the FUV wavelength range (Broadfoot et al. 1979, Clarke et al. 1980) and monitored regularly since then. Accurate knowledge of the auroral morphology is essential to identify the magnetically conjugate active regions in the magnetosphere and even, hopefully, to characterize the physical plasma processes responsible for particle precipitation. Two years of imaging with the Faint Object Camera from 1992 to 1994, made a breakthrough in our vision of the FUV aurorae, even at the degraded resolution resulting from the telescope aberration (subarcsec, with variations depending on the extent of the feature). The complex morphology of the north was revealed, and its main features identified (e.g., Gérard et al. 1994 and references therein), (i) a narrow bright oval lying at the footprint of magnetic field lines crossing the equator in the distant magnetosphere, near 30 R, possibly at the boundary of the polar cap, (ii) some diffuse emission, longitudinally modulated (peaking near System III longitude 150--160 ), at the footprint of field lines connected to the outer Io torus (mainly detectable in the short wavelength H Werner bands and at Lyman ), (iii) a very broad and bright ``transpolar'' arc across the polar cap along the meridian 160 . By contrast, the south aurora was much less studied. An important finding was that all the structures were co-rotating with the planet, with little local time dependence, demonstrating that, by contrast with the Earth, the Jovian auroral processes are controlled by the structure of the magnetic field rather than by the solar wind dynamo. In both cases, we use two HST orbits, six hours apart, in order to get both faces of the planet (Jupiter's rotation period is 10 hours), with the north aurora best viewed on one images and the south aurora best viewed on the other (tilted magnetic axis) and during each orbit, we take one 11-minute image of each polar region, so that the north and south aurorae are observed quasi-simultaneously. Figure 1 shows the two pairs of images for August 9, each placed in a single frame and with an oblate spheroid overplotted to represent the planet limb. Due to good spatial resolution, sharp limb, and accurate offset between the images, the limb can be determined within about 200 km. That might depend on what gravity Is, in the Clintonesque sense.